Pizza is popular with everyone. While we all can debate our favorite toppings, pizza is a go-to food for almost any occasion. Do you remember how Ellen delivered pizza to the Oscars? Pizza Hut does!! And to celebrate, Pizza Hut will offer the following special. 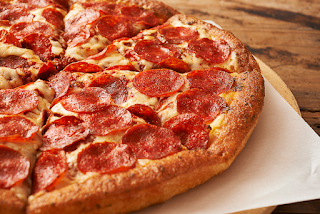 Visit www.PizzaHut.com or download the Pizza Hut Mobile App and now through Feburary 27, you can get a 50% off offer. Additionally, pizza lovers can also enter promo code "FEBFIFTY" and the deal will be applied to their order. The offer will be available for all menu-priced pizza orders placed through Pizza Hut's online ordering systems for carryout or delivery. Deal does not apply to other menu items, tax, delivery charge, or driver tip. Don't miss this great pizza deal!